I have successfully renewed my PRC Professional License/ID Card today here in OFW One Stop Processing Center at Clark Skills and Training Center (formerly Polytechnic College), Clark, Pampanga! Let me share to you how I did the renewal using this post. I got my license as a Chemist last 2015 right after passing the board examination. PRC Professional License needs to be renewed every three (3) years, making my license as a Chemist valid until year 2018. Then, it will be due for renewal. Years ago, renewal of licenses in my filed is an easy task (not counting the long waiting lines to endure). However, a mix of good and bad news started to circulate since last year not only for Chemists but all of the professionals here in the Philippines. June 2018. Added commute and travel instructions. Let’s review the good news first. The government is trying to prepare its professional workforce to be more competitive with the neighboring countries for ASEAN integration. That’s good news indeed. This integration will enable professionals here in PH to work abroad carrying the same credentials. Of course, workers coming from other ASEAN countries can also work here. But that’s not we really cared for. The bad news is that the government will start to strictly push the Continuing Professional Development (CPD) program for professionals. 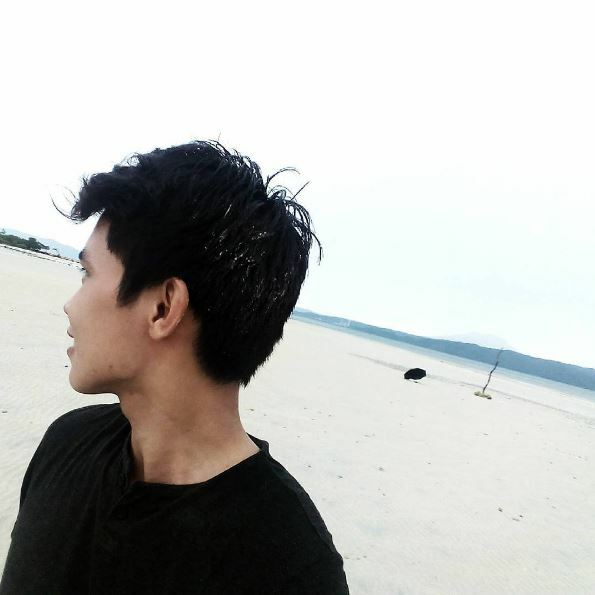 Read my board exam experience here: Blog Comeback: Chemist Board Licensure Examination. 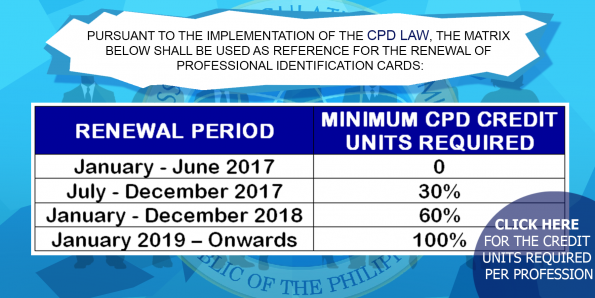 Under CPD, each profession has corresponding credit units (CU) required prior to license renewal. These credit units need to be earned through seminars and other means before a professional can renew his/her license. My professor in Chemistry told us once that CPD already exists even in the 90s but wasn’t fully implemented in all fields. Mainly for one reason: the current state of the Philippines, including the capability of professionals to be obliged for this isn’t ready for such. How can I comply to this new rule? I’ve just started working and my salary won’t even suffice for my daily needs and other obligations. Why should this be implemented? This is just an additional burden for professionals. 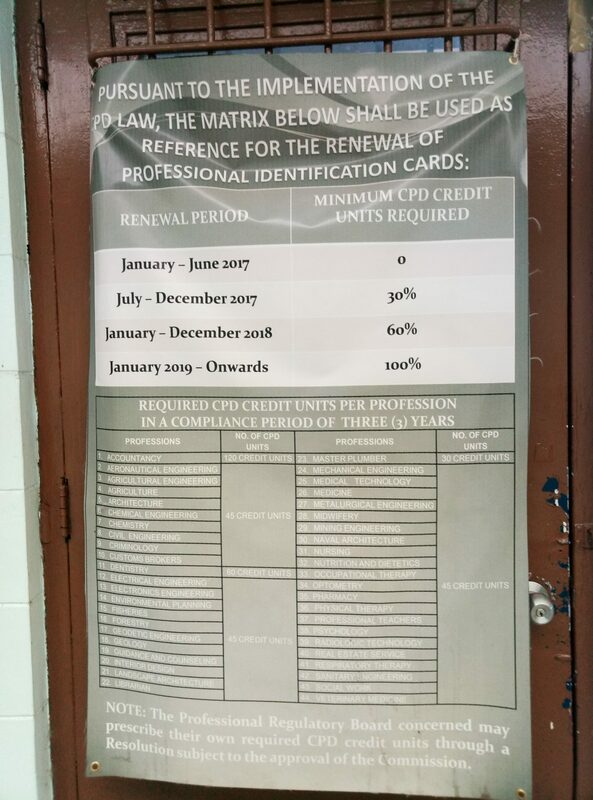 Gladly, PRC somehow answered this early this year by releasing a matrix for CPD credit units requirement. Although we are all hoping that CPD shouldn’t be implemented, we need to comply to this. This is also for ourselves and not just for the government’s sake. According to the 2016 revised CPD guidelines, most of the professions require 45 credit units. Others start at 30 and up to 120 credit units minimum for our accountants. Wew. That’s a bit steep requirement, huh. Anyway, I’m with the most of the professionals that needs to earn 45 credit units for renewal. I am both on the “lucky” and “blessed” side since I can already renew my license one year (1 year) ahead of its expiration! Since my license/PRC ID card will expire on May 2018, I can already renew it as early as May 2017! Right after knowing this, I planned to renew my license after my birthday. I planned to do it on https://www.prc-online.com/ but later found out that I can still do it as walk-in in Clark Polytechnic. Oh, this will be the first ever that I chose to do a thing personally rather than online! Haha. 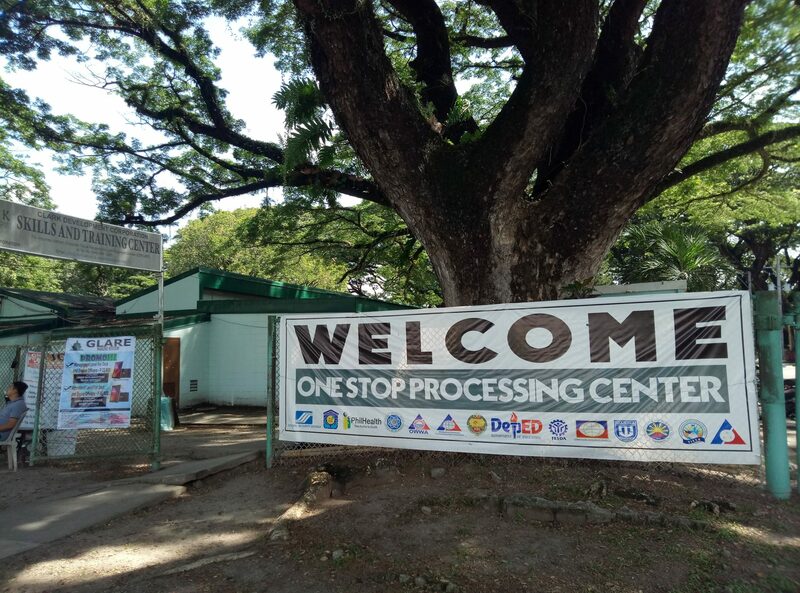 Note for other readers: OFW One Stop Processing Center currently accepts walk-in clients for renewal only. For application for board exam, you need to do it first online at https://www.prc-online.com/ and select Clark Polytechnic as branch/office. 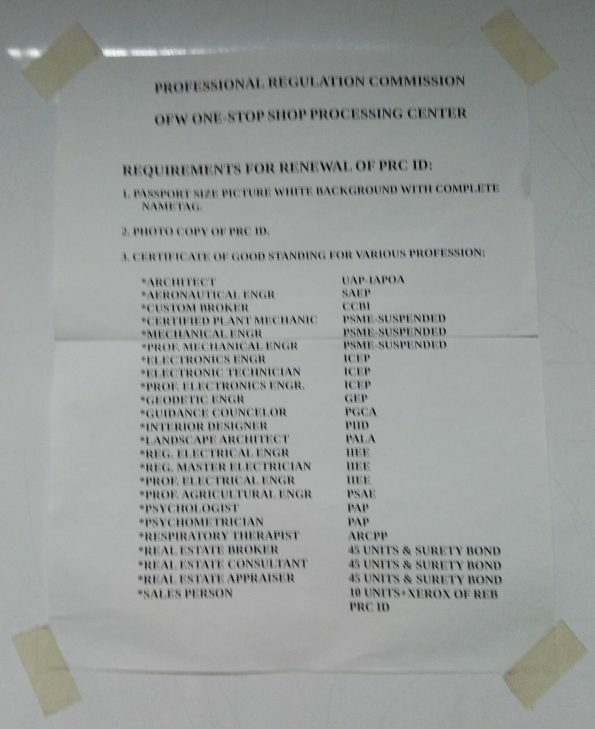 PRC OFW One Stop Processing Center Polytechnic: PRC ID Renewal Matrix. PRC OFW One Stop Processing Center Polytechnic: PRC ID Renewal Requirements. 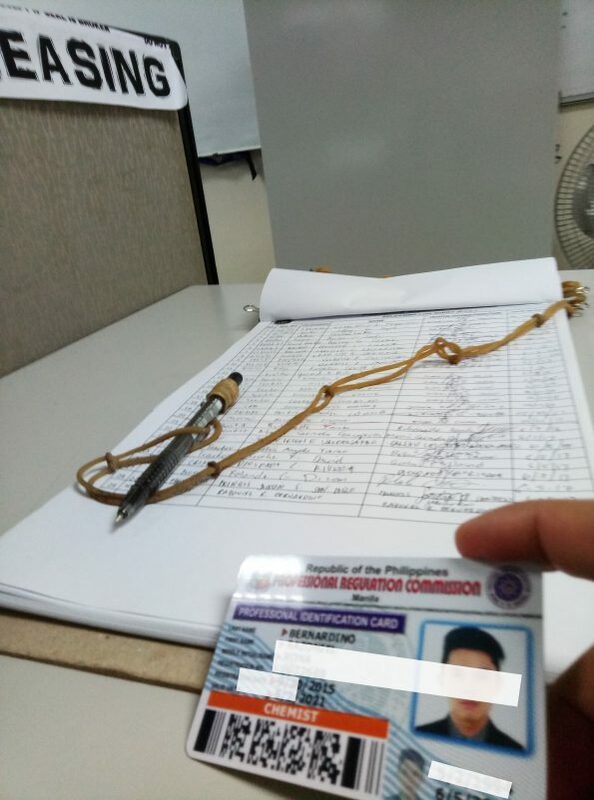 PRC OFW One Stop Processing Center Polytechnic: Sample ID Picture. After arrival in Clark Polytechnic, various government offices will welcome you. Just choose the door of the office you want then come-in and do your transaction/s. This is indeed a one stop center. At PRC, I filled-up a renewal form for Step 1, and submitted the completely filled-up form to Step 2. The officer only asked for my PRC ID then returned it. I guess it is just for validation purpose. I am happy for this since I forgot to bring a photocopy of my ID. Haha. Then, I am told to seat and wait for my name to be called. In about 20 mins, my name was called by the cashier for payment. I am a bit disappointed since instead of giving me the card in releasing section, I was given a claim stub instead. 🙁 Well, there are many people that is at the center for renewal that time. Maybe they can’t accommodate us all and give our new cards right away. 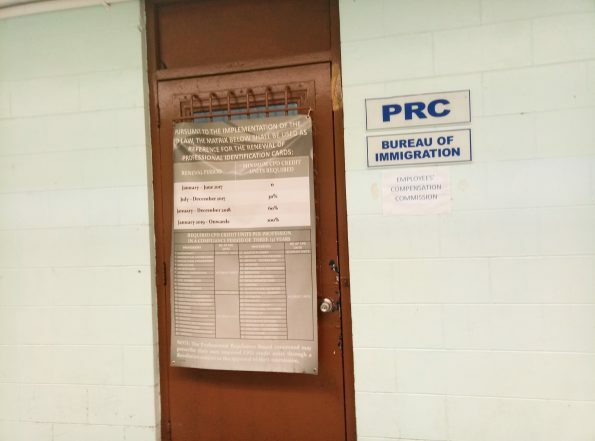 PRC OFW One Stop Processing Center Polytechnic: PRC ID Card Releasing. June 2018. This blog post still gets visits even after a year. So I guess it will be a good thing to add simple instructions on how to go Clark Polytechnic. Make a way to be dropped in Mabalacat City Bus Terminal Complex. This is also called Dau Terminal as it was located on Brgy. 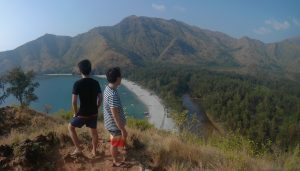 Dau, Mabalacat, Pampanga. Look for Sogo Hotel beside Wilcon Depot. Cross the pedestrian lane infront of McDonald’s Dau (corner South Star/Manson Drug). Ride a small jeepney with a signage of “SM Clark Main Gate”. There are lanes of jeepneys waiting for passengers near the pedestrian lane. You can walk until you get to PNB/Mercury Drug if there was no jeepneys on sight. Fare is Php 8.00. As of July 2018, jeepneys are being stationed in front of Jollibee especially during peak hours. Tell the driver to drop you off in Main Gate or Bayanihan Terminal. This is the last stop before the jeepney will go inside SM Clark Jeepney Terminal, passed the traffic lights. Make sure you already alight or you’ll be using the long footbridge to get back to Bayanihan. Look for “gold-colored” jeepneys with a Route 2 signage. This will be the last shed on the right side if you followed the instructions above. The shed is a direct point to Chowking on the other side of the street. Ask the conductor/driver if the jeepney will pass to One-Stop/Clark Polytechnic. This is a must because not all Route 2 jeepneys include this on their route, especially if you arrive on the terminal before 7:30 am in the morning. Fare is Php 13.00. The route will be straight ahead of M.A. Roxas highway and will turn left in Jose Abad Santos Avenue. You’ll know that you are getting near if Korean shop and restaurants were already on sight. Easily renew your PRC ID Card now.